It has been too long since I talked about tomatoes. My folks-in-law came over the other day bearing a pile of tomatoes from their garden. Drippingly sweet, these little gems have adorned plate after plate for 3 days and running. I have enjoyed them with mozzarella, poached eggs and rosemary toast. Tomorrow they will top quiche and nachos, and who knows about the next day!? But I am talking tomatoes because I have an urgent need to share with you the recipe for my tomato sauce. I could almost call it my secret sauce (well, not if you keep reading) because it bumps up the flavor in dishes that might otherwise be boring. Mostly I am beside myself because I taught myself canning basics this year, and putting my tomato sauce on my pantry shelves was my priority. 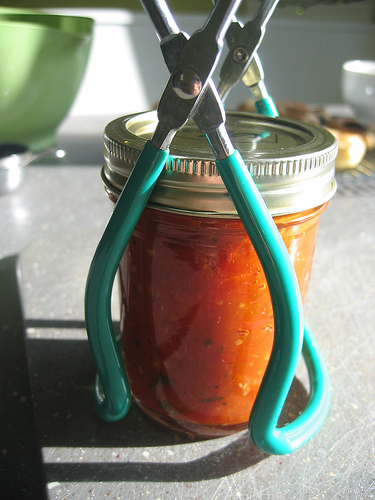 I can hardly cajole myself to open a jar, it is such a pleasure just to peek in my pantry at jars filled with tomato-garlic-basil bliss. I need to be frank: I use this recipe as a rough estimate. I often double or triple the recipe and usually just start slicing and sauteing a slew of garlic and 'tomats.' In other words, don't feel tied to the amounts, they are a great place to start but feel free to jump off if you have extra garlic and tomatoes, mixed heirlooms or some flat leaf Italian parsley. Sometimes I use a pile of dried Italian herbs in place of the basil and oregano (please just promise me the dried herbs are under 6 months old or it just won't be as lovely). Other days it is all oregano (I sincerely believe they should make oregano gum instead of spearmint). I adore making fresh tomato sauce, then freezing or canning portions for later. This red sauce is a mainstay in my pantry and recipe repertoire. It is a regular contributor to my layered Italian dish, stands alone as dipping sauce for eggplant bites, is my pizza sauce, and recently found a new home in my last round of chili.